In a previous post I looked at how herbs in a recipe might work medicinally. But medicinal recipes rarely contain a single ingredient (which would be known as a ‘simple’), and so we should also assess how the herbal ingredients in a recipe might work together. Much depends on the kind of preparation used in a recipe and how the combination of herbs might work together. other benefits or disadvantages arising from combining the herbs. The way in which recipe ingredients are processed is significant as, broadly speaking, different plant constituents will dissolve best in water or alcohol. Most of us are familiar with the process of standing leafy herbs in hot water to make tea, and such an infusion will dissolve constituents like tannins and alkaloids. A decoction is based on a lengthier process of boiling bark and roots and may extract more constituents. However aromatic or resinous constituents need to be dissolved in alcohol or evaporated. The process of distillation is likely to produce more aromatic results which I look at it in more detail below. Other processes might not involve liquids at all, for example when ingredients are burnt to ashes – leaving mostly mineral salts. Bio-availability refers to the extent of absorption of nutrients or medicaments in the body and the amount of active substance which is made available in the body. The type of preparation indicated in a recipe can have a considerable effect. For example, the use of oils and fats as a vehicle (or carrier) in an ointment is essential for plant constituents to be absorbed and penetrate the skin barrier. However, the importance of preparation and bio-availability is an aspect of herbal history which is poorly understood despite numerous research studies in ethnopharmacology. Woman with bellows. 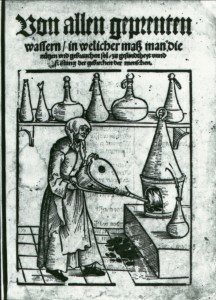 Michael Schrick, Von allen geprenten Wassern (Nürenberg: Jobst Gutknecht, 1530, title page). Image credit: National Library of Medicine. The process of distillation would have had a significant effect in isolating the more soluble and readily evaporated plant constituents, the terpenes. This usually involved boiling plants in water and collecting the steam when cooled back to a liquid, as in the image above. The product of distillation includes both floral waters and essential oils which float on top of the water and so can be separated. As a rough guide, many plants yield around 1% of essential oil from steam-treated plant material, as well as larger quantities of a floral water. The recipe I have been looking at in recent posts involves distillation. Take two hanfull of Isope two of peneroyall and two hanfull of Groundsell one handfull of wild mints two hanfulls of balme: …. then still the hearbes and water togather in a rose still then let the Glass bottle stand in the Sume Sinnce two Months Close Stopped from any Ayre it Makes the water much better. This recipe would have produced a distilled water containing small amounts of essential oils, known as a hydrolat. Of particular note, the immediate products of a distillation are often chemically reactive and the instruction to let the distilled water stand for two months would give a more stable aromatic product. The resulting water would have contained greater quantities of terpenes or essential oils than an infusion and relatively few alkaloids. In this series of posts I have been aiming to make explicit the various issues and resources that may be relevant in thinking about the potential medicinal actions of herbs in recipes. In the next post (and last in the series of eight) I will overview the protocol as a whole. See ‘Introduction’ in Susan Francia and Anne Stobart, eds. 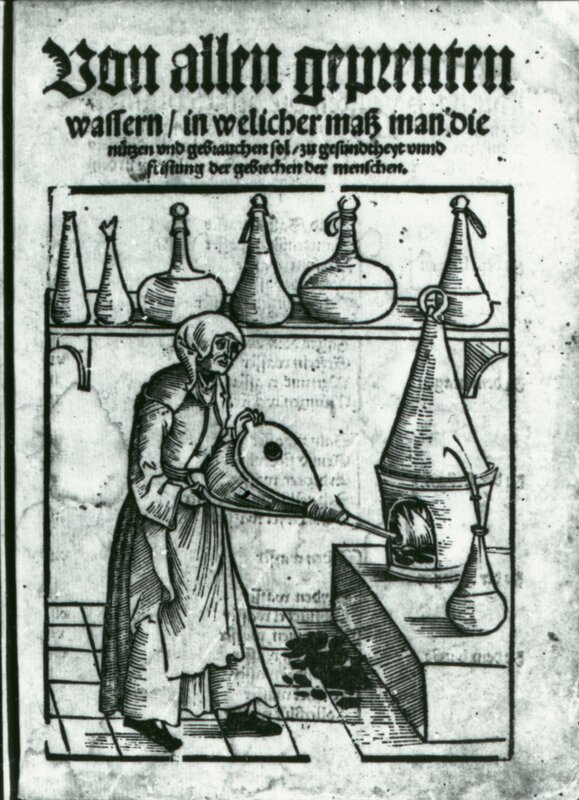 Critical Approaches to the History of Western Herbal Medicine: From Classical Antiquity to the Early Modern Period. London: Bloomsbury, 2014, p.6 and n.22. Simon Mills and Kerry Bone. Principles and Practice of Phytotherapy. Churchill Livingstone, 2000, p.23. See Francis J. Brinker. Complex Herbs – Complete Medicines: A Merger of Eclectic & Naturopathic Visions of Botanical Medicine. Sandy, Oregon: Eclectic Medical Publications, 2004. See also Anne C. Wilson, Water of Life: A History of Wine-Distilling and Spirits, 500 BC-AD 2000. Totnes: Prospect Books, 2006. Jane Buckle. Clinical Aromatherapy: Essential Oils in Practice. 2nd ed. Philadelphia: Churchill Livingstone, 2003, pp.59-61. Shirley Price and Len Price. Understanding Hydrolats: The Specific Hydrosols for Aromatherapy. Edinburgh: Churchill Livingstone, 2004.